The urinary system, otherwise known as the urinary tract, consists of 5 major components: 1) two kidneys, 2) two ureters, 3) bladder, 4) sphincter muscle, and 5) urethra. The kidneys filter waste from the blood and produce urine. The kidneys typically produce 30-90 ml of urine an hour. 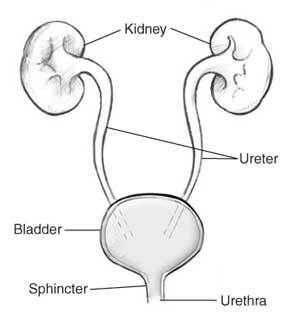 Urine flows out from the kidneys down the ureters and into the bladder. The ureters are long, narrow tubes that connect the kidneys to the bladder. Each ureter is approximately 24-30 cm long. The ureters are connected to the bladder in a way that helps prevent urine from flowing back from the bladder into the kidneys. The bladder is a hollow organ with a muscular wall. The two primary functions of the bladder are to (1) store, and (2) empty urine. On average the bladder can hold approximately 500 ml of urine before a strong urge to urinate is felt. The size and shape of the bladder varies from person to person. Emptying the bladder requires coordination of both voluntary and involuntary muscles. Emptying occurs when the bladder muscle contracts and the sphincter muscle relaxes, allowing urine to pass through the urethra and out of the body. Two ring-like muscles called internal and external sphincter muscles surround the urethra. The external sphincter is voluntarily contracted to control when emptying the bladder occurs. A healthy and functioning nervous system is required to coordinate messages between the bladder and sphincter muscles. When the bladder is full, nerve impulses are sent to the lower portion of the spinal cord, and then to the brain. The brain subsequently sends a message to the bladder telling it to contract and release urine. Damage to the nervous system due to spinal cord injury or disease can disrupt this complex process of communication and result in a neurogenic bladder. A flacid or atonic bladder will not contract, which results in the retention of urine. This occurs with a spinal cord injury. A spastic or reflux bladder results in frequent uncontrolled emptying (voiding) from a combination of bladder spasms and lack of sensation. This occurs with a spinal cord injury. An uninhibited bladder results in frequent and urgent urinations. This can occur with stroke, head injury, or multiple sclerosis. A sensorimotor paralytic bladder results in the inability to empty the bladder due to damage to the peripheral nervous system. This can occur with diabetes, mellitus or pelvic surgery.